Have news! Members, email your news to: Publicity@SalemArts.org with the subject line "NEWS BLOG POST" if you want your event, show, or news posted in our "News" section. Additionally all posts also go to our Twitter page. We encourage members to share posts from this news feed on Facebook and all your social networks. SculptureNow is accepting proposals from established and emerging artists for its 19th consecutive, annual exhibition of large-scale, outdoor sculptures at The Mount, the historic museum/estate of Edith Wharton, in Lenox, MA. The show is scheduled to open on June 1 and close on October 31, 2016. Up to 30 sculptures may be selected. There is no application fee. The exhibition will include invited and juried sculptors. Invited artists in past exhibitions include William Carlson, Nancy Graves, Tim Prentice and George Rickey. Works should be suitable for long-term, outdoor exposure, fabricated and installed in a viewer-safe manner, and of an appropriate outdoor scale. Sculptures which have been exhibited within a range of 50 miles from The Mount in the last 3 years, and sculptures that need refinishing may not be accepted. Sculptures which differ significantly from submitted images will need approval prior to installation. Artists who require installation assistance should detail their requirements when submitting a proposal. All sites are on grassy areas. SculptureNow and The Mount will provide installation/de-installation support, liability insurance and insurance for the sculptures. A reception, including an artists-guided tour, is scheduled for mid-June. Self-guiding maps of the exhibition will be available at The Mount, on the websites of SculptureNow and The Mount. 8,000 exhibition cards will be distributed throughout the Berkshires and beyond. Monthly, artists-guided tours will be scheduled. The Berkshire region of Western MA is well known for its rich cultural venues and beautiful nature, attracting visitors from New York, Boston and beyond. The Mount, in the heart of the Berkshires, is both a historic site and a center for culture, Open to the public from May through October, every day, it attracts more than 40,000 visitors annually, who enjoy the exquisite grounds, the gardens, the estate, and the great performances of music, theater, and literature. The SculptureNow exhibitions at The Mount have become a sculpture destination for collectors and visitors and have been favorably featured by Sculpture Magazine, NPR’s WAMC, the Boston Globe, Art New England, Berkshire Magazine, the Berkshire Eagle, MassLive and numerous other websites and publications. or call 413 623 2068. Prospectus and application forms are available for download here. See information about The Mount sculpture show, the 2016 prospectus and 2016 application form here as a pdf or a Word doc. The City of Salem seeks qualifications from artists and designers interested in creating a site-responsive public art installation in the heart of downtown Salem during the summer/fall of 2016. The public art project will be a prominent feature in the kick-off of the Salem Main Streets, Salem Arts Festival, an annual three-day celebration of all the arts that will begin June 4, 2016. Artists and designers working in any media, including light, are encouraged to submit qualifications. The City is particularly interested in installations that have an impact when viewed across the site and that are effective at night as well as during the day. Salem is a growing, culturally diverse city with a rich literary, architectural, maritime, and immigrant history, including its role in the 17th century Salem Witch Trials. In the 19th century, it was one of the most important seaports in the country. Today it is lively destination that draws people from around the world. The site for the public art project is the area surrounding Old Town Hall from Essex Street on the north side to New Derby Street on the south side. It includes a section of the Essex Street pedestrian mall, all of Derby Square, and Artists’ Row. Except for Front Street at the lower end, the site is a pedestrian-only zone. Retail shops, restaurants, businesses, and residences are located throughout the area. The architecture includes historic colonial buildings as well as newer structures. In addition, various landscape and hardscape features could be integrated with the public art project, such as bollards, steps, lamp posts, brickwork, and trees. Notable topography from the bottom of the plaza at Front Street to the top of the hill at Essex Street creates a dramatic space around Old Town Hall. The City of Salem public art project is an opportunity to create a unique experience for the thousands of visitors and residents who enjoy downtown Salem in the summer and fall. In addition to the Salem Arts Festival, several other events, as well as a weekly farmers’ market on Derby Square Plaza, mark the season and draw crowds to the City. The budget for the Salem Arts Festival public art project is $7,000.00, which must cover all costs. Submissions should be emailed to Deborah Greel, Public Art Planner, City of Salem, dgreel@salem.com. If you do not receive a confirmation email within 24 hours, please re-send or call Deborah at 978-619-5681. Visit www.salemartsfestival.com for more information about the Salem Arts Festival. The Brookline Arts Center is inviting Massachusetts ceramics artists to submit conceptual works in clay for a show in our gallery in March 2016. Ceramics are one of the longest lasting indicators of culture. With this in mind, the Brookline Arts Center invites Massachusetts based ceramic artists to submit their most conceptual works in clay. We are looking for work that provokes thought through use of color, shapes, unexpected details and unique functionality. Works could include a range of abstract sculptures, vessels as art or interdisciplinary installations. Eligibility: All ceramic artists residing in Massachusetts are eligible to submit work. Up to six pieces of original artwork can be submitted. Salem Arts Association Observes World AIDS Day today with this memorial to the profound loss of creative talent caused by the AIDS epidemic. 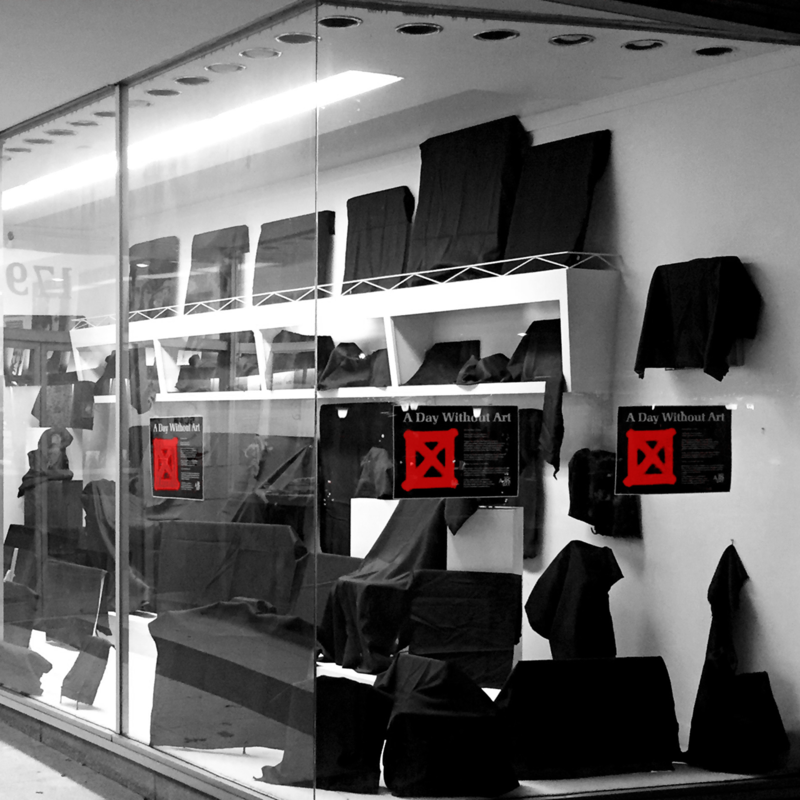 Please stop at the gallery and reflect on our window display today. Today we stand together, Today we stand in silence. Today we mourn the loss of painters, photographers, dancers, printmakers, actors, filmmakers, singers, choreographers, poets, sculptors, authors, musicians, designers... all the artists who have died from AIDS. Today we collectively grieve the loss of future work from recognized artists, as well as the absence of countless artists yet to be. 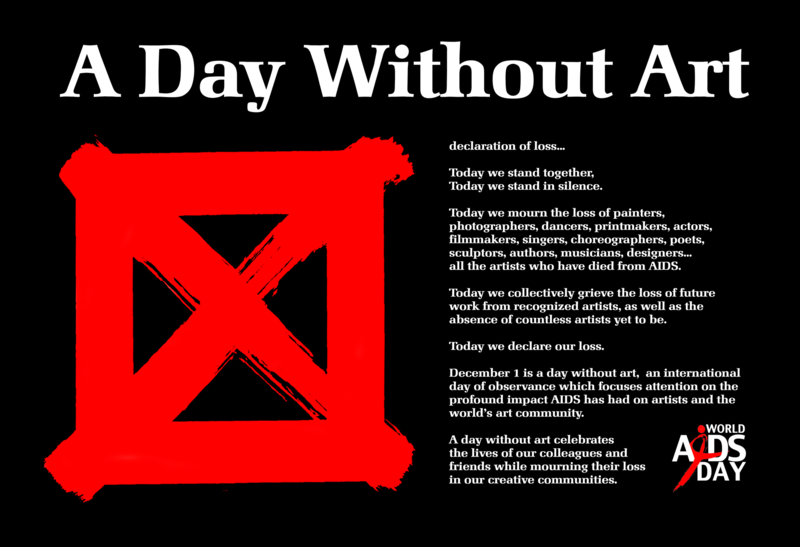 Today we declare our loss.December 1 is a day without art, an international day of observance which focuses attention on the profound impact AIDS has had on artists and the world’s art community. A day without art celebrates the lives of our colleagues and friends while mourning their loss in our creative communities. Enjoy even more art by more of our artists as we bring in additional work just for these special days. Please join us! Create a piece of Arnold Arboretum history…enter our contest to design the 2016 Lilac Sunday t-shirt! The Arnold Arboretum of Harvard University invites artists of all ages to submit their designs for Lilac Sunday 2016. Lilac-themed t-shirts have been a tradition at Lilac Sunday for many years, and continue to be a highly anticipated and popular memento of this event. Designs must be original artwork for the front of a t-shirt, suitable for men and women. Color of t-shirt to be determined by the Arboretum staff, but suggestions on color are welcome. Designs must be 2- to 4-color for t-shirt screen printing (white is considered a color). Each artist may submit up to three designs. Deadline for submissions is December 15, 2015. Please submit a digital file of your design (.pdf, .eps, .ai, .jpg, .psd). Illustrator vector format is preferred. Winning artwork must be delivered as vector artwork or as high-resolution (600 epi) scan at the final print size. Winning artwork becomes the property of the Arnold Arboretum. Colors and fonts may be altered at Arboretum discretion. Artwork may be used in other promotional materials for Lilac Sunday, possibly including but not limited to day-of-event signage and temporary tattoo. Submissions will be evaluated based on how well they reflect the spirit, history, and beauty of Lilac Sunday at the Arnold Arboretum. The competition will be judged by Arnold Arboretum staff. The winner will be announced in January 2016. The winner will receive ten t-shirts, a 1-year household membership to the Friends of the Arnold Arboretum, and have their name credited, if desired, on all promotional materials. The Cloister Gallery at St. Andrew’s Church is featuring an exhibition of artwork by local artists Judy Beals, Janet Juel Cook and Patricia Dunbar. The show will open with a reception on Sunday November 8th from 11:15am-12:30 p.m. and run through Thursday January 14th. The Cloister Gallery at St. Andrew’s Church is located at 135 Lafayette St., Marblehead. The Gallery hours are M-Th 9am-4pm, F 9am-12pm, Sa 8:30-11:30am, Su 8am-12pm. The Gallery is handicapped accessible. For more information, please call 781-631-4951 or visit standrewsmhd.org/cloistergallery.html. Judy Beals has adventured into watercolor, acrylic, encaustic, collage, print- making, and pastels. Her subject matter focuses on the layers of our earth: water, earth, and sky and the spirit and energy that connects them. Janet Juel Cook draws her inspiration from her native North Shore area. Painting in oils, she depicts familiar outdoor scenes of the ocean, beach, still life, landscapes, and children playing by the shore. Patricia Dunbar is a life-long designer, with an interest in typography, drawing, photography, and painting. Pat paints with transparent watercolor as she loves watercolor for the clear colors, the transparency, and the washes that can be built up to create interesting surfaces. Flux public opening reception is Saturday, September 26, from 4-8 p.m.
Trevor Smith, Curator of the Present Tense at the PEM for Strandbeests, will jury this special exhibit. The exhibit is located at the Salem Arts Center, 179 Essex Street, Salem, Massachusetts. The exhibit will run September 17– October 17, 2015. For more info contact president@salemartsassociation.org. Salem Arts Association is a non-profit organization. 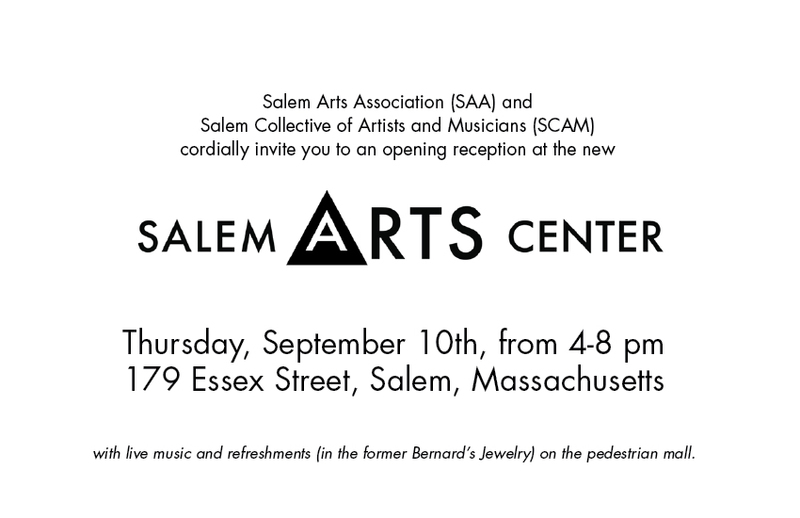 Please join us for our grand opening celebration at the Salem Arts Center, Thursday, September 10th from 4-8 pm at 179 Essex Street in Salem. There will be live music and refreshments. The Salem Arts Association is currently in search of members (of at least one year) to fill officer positions for the Jan.-Dec., 2016 term. If you are interested in serving S.A.A. in any of these roles or have any questions, please contact us before September 1st with the postition in which you are interested. We are also looking to add to our Board of Directors. If anyone has any recommendations of a community leader who would help S.A.A. continue to grow and develop, please contact us also by Sept.1st.